been changing and evolving for hundreds of years. However, even in the last fifty years, one more difference has been created in the German language, that of the East varieties versus the West varieties. Here's an article covering how this split happened, the extent of the differences, and some common examples. This article specifically refers to differences between East and West Hochdeutsch, the standard version of German that most Germans speak. Differences between the German dialects of different regions—Schwäbisch, Bayrisch, and so on—even if they are definitely located in more eastern or western (or northern or southern) locations are not the focus of this article. Also, the differences between the dialects are far greater than those within Hochdeutsch: While East and West Hochdeutsch is mutually intelligible, if perhaps regarded as “quaint" by the other, many Germans have difficulty understanding each other's dialects. One further disclaimer: These are general differences. Do not expect every specific East or West German to follow these trends. The particular attitudes and sentiments of the individual, especially with regard to political forces that shaped these differences, play a large part into whether they follow these trends or not. Let's begin with a little historical primer. After World War II, Germany was rather infamously divided into two parts: the East of "Ossies," which was heavily influenced by Soviet culture, and the West of "Wessies," which was heavily influenced by European and American culture. The physical barrier between the two was strictly enforced, most famously at the Berlin Wall, leading to almost complete cultural independence from each other. 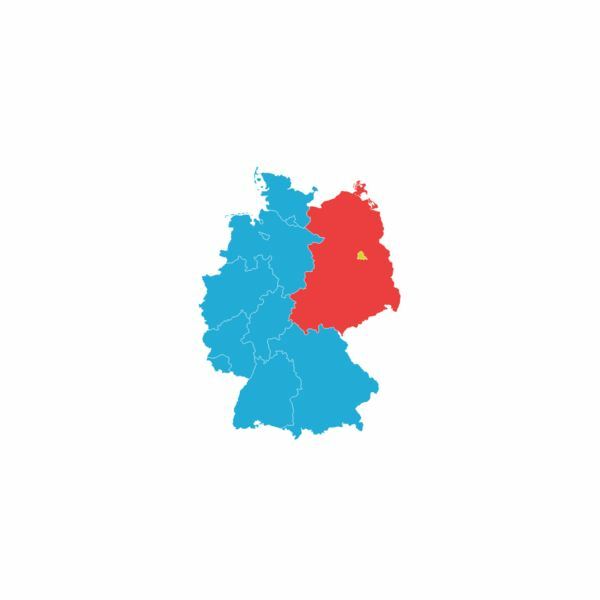 While the physical barriers are now gone and Germany is once again united as a single country, the time period where the two halves of Germany were influenced by two very different cultural and political environments led to these differences in vocabulary. As you can imagine, these differences are highly sensitive to the age of the German speaker. Those who grew up before or during the period of separation will represent more of these differences. The younger generation who have grown up in a unified Germany, while of course influenced by their parents, are increasingly less likely to display these differences. This is the most obvious category of differences, if one that isn't strictly used anymore. Because of the vast differences between the East and West German governments, they used, of course, vastly different terms and acronyms to refer to their respective parts of government. The West government dominated after the unification, meaning that most of the East German political terms were flatly tossed aside. However, be prepared in any discussion about political history with an East German to hear some words you probably won't recognize from the current government. While Socialist-era East Germany did not attempt to change the German syntax, it did provide its people with fewer products and notions from the outside world. Also, a certain suspicion of Western influence became commonplace, including the adaptation of these newfangled words to describe newfangled technology. In general, older East Germans prefer to use the older versions of words, as opposed to the Anglicized versions that many West Germans prefer. Even for new technologies, they preferred constructing "proper" German words out of other German words, as Germans often do, as opposed to adapting the common Western name. A great example of this is the word for a sort of traditional fried chicken. While West Germans will quickly refer to it as a "Broiler," a word obviously borrowed from English, East Germans will still use the traditional word, "Brathähnchen." The same has happened with numerous phrases. There's an old saying, "Das hat Sinn," literally, "That has sense." While this remained in place in East Germany, in West Germany the phrase changed to "Das macht Sinn," "That makes sense." This is a direct, if subtle, Anglicization that West Germans were more susceptible to than somewhat less Anglo-friendly East Germans. It wasn't just new vocabulary that changed: Old words subtly changed in meaning and connotation just because of the context in which each respective culture would use it. An example of this is the word "Arbeitsberatung." Generally, this translates to some sort of work meeting. Because of the different work environments, in the East the connotation became more of one of where the boss tells you what to do next, one that is more authoritarian. In the West, however, the connotation is that it is one where the attendees discuss as a group what to do next and how to improve–a more capitalist attitude toward business than socialist. However, with the younger generation of Germans, many of these subtle East-West differences are disappearing, along with the more ancient dialects. They're still quite audible, if you listen closely—but don't expect to be seeing too many of these differences twenty from years now, and it isn't going to be favoring the East German changes. The West and its influencers, the general European culture and that of America, is dominating any changes made within the German language as a whole. While these changes are happening more quickly within the more globalized environments of the city, both in East and West Germany, they are also seeping into the countryside, which are otherwise slower to change their ways. After all, languages are living, breathing things; they evolve and change to their environment, just as anything else. For straight lists of specific vocabulary examples, I would highly recommend the German Wikipedia compilations of DDR (East) German and BRD (West) German, respectively. You can also read this great article about the Rise and Fall of the Berlin Wall.